In Berlin, where contemporary music thrives from the Philharmonie to off spaces, it is a widespread perception that New York’s mainstream institutions are afraid to program anything past Stravinsky. 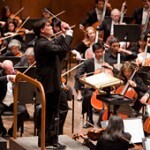 A look at Alan Gilbert’s recent undertakings with the New York Philharmonic, notably in a hugely successful “360” concert of Mozart, Stockhausen, Boulez and Ives in June that exploited the full space of Park Avenue Armory and was streamed live on medici.tv, reveals the idea to be a fallacy. Yet it is ironic that the orchestra’s new season has kicked off with a tribute to Le Sacre du Printemps (The Rite of Spring). The concert is only the first of many events that will commemorate the centenary of Stravinsky’s ballet, which falls on May 29 of next year. As with many works that have shaped the canon, the work was a scandal upon its Paris premiere. Choreography by Vaslav Nijinsky reportedly set off physical fights in the audience, perhaps a response to the primitive energy that Stravinsky’s music launched onstage—a far cry from the cultivated elegance high society expected to encounter on the Champs-Elysées. Le Sacre has since become one of the most widely recorded and well-known 20th-century works. Even if it doesn’t feel monumental, in the right hands, it is still hard to resist the score’s raw power. 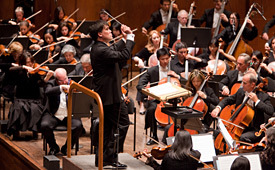 Alan Gilbert and the Philharmonic, seen at Avery Fisher Hall on September 19, made a strong account for venerating Stravinsky, investing ripping strings and grinding rhythms with the animalistic vigor that turns this music into a pagan feast. The painterly dissonances of “The Sacrifice” emerged with ethereal mystery, while the players invested the metallic, stabbing attacks of the final “Sacrificial Dance” with unrepressed drive. The delicate, overlapping wind solos of the opening “Adoration of the Earth” emerged with unpretentious clarity before ceding to the mechanical churning of the “Augurs of the Spring” that effectively wipes the unconscious of its need for soothing classical idioms. Beethoven’s Third Piano Concerto, performed with Leif Ove Andsnes, received a less unified, persuasive interpretation. Andsnes could not quite match the heat of the Philharmonic in the opening Allegro, although his clean, incisive pianissimi nearly redeemed the performance. He and Gilbert communicated effortlessly, and yet the emotional arc from inner torment to Mozartean bitter-sweetness at times lacked conviction. The inner Largo movement felt a bit studied despite the orchestra’s sensitive phrasing, while the players’ tempered use of bombast was well suited to the final Rondo in its stormy pursuit of light-heartedness. Andsnes brought a natural, although not terribly spontaneous, playfulness to his final solo passages. Opening the program was Kurtag’s …quasi una fantasia…for Piano and Groups of Instruments, an approximately 10-minute work that calls for the distribution of instrument clusters around the performance space while the pianist (Andnes) remains onstage in pseudo-concerto style. The rustling percussion and sparse descending piano melodies that open the piece would have been even stronger with the lights dimmed, but even more importantly than visual aesthetics, Avery Fisher Hall did not provide ideal acoustics. The snare drums behind me at one point overwhelmed the timpani onstage. Gilbert nevertheless coordinated the work with care, allowing sensuous sighing melodies to linger as strongly as the battery of percussion. Although the piece is not tailor made for Avery Fisher Hall, Gilbert is making a concerted effort to seduce his audience base into what many listeners would consider unusual repertoire, and one hopes that he will succeed. It takes vision, charisma and daring but sound artistic choices to guide an orchestra through the current age of economic uncertainty and cultural levelling. And if Stravinsky’s Rite of Spring can teach us anything, it is that challenging the status quo is sometimes the only way to make artistic progress. As I descended into the subway after the concert, the flute melody from the opening “Adoration of the Earth” hovered mystically. It was of course just a busking musician. Even if New York does not meet the expectations of more academically-minded new music connoisseurs, one can´t deny its magic. This entry was posted on Friday, September 21st, 2012 at 1:11 pm	and is filed under Berlin Times. You can follow any responses to this entry through the RSS 2.0 feed. Both comments and pings are currently closed.